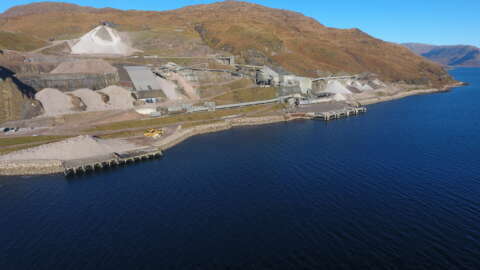 Glensanda Harbour is the dedicated port of Glensanda Superquarry, which produces c.7,000,000m/t of crushed rock granite aggregates per year. Aggregates are loaded by a dedicated shiploading conveyor system, designed to reach all holds of a Cape size bulk carrier without having to move the vessel. Aggregate sizes vary from fine sand up to 180mm. Grades produced can be mixed in any combination to suit customer requirements, with loading rates up to 6,000m/t per hour. Rock Armour is also produced to any size specification required in accordance to BSEN 13383-2-2002. Glensanda is only accessible by sea; there is no road connection. Vessels up to 250m are berthed on the main loading quay, while the smaller armourstone loading berth accommodates vessels up to about 120m. Also available a ro-ro slipway berth for loading/unloading barges. Tide ranges from 0.3m to 4.3m . MHWS 4.2, MHWN 3.1, MLWN 1.9, MLWS 0.8 . Berth generally free of swell. Due to remote location, Glensanda is capable only of loading quarry products; no bunkering, fresh water, resupply or repairs available. All berthing / loading activities are carried out by Aggregate Industries personnel. Pilotage is provided FOC where required, usually for vessels greater than 120m / 8,000 Dwt. Vessels are usually berthed without the need for tug assistance. Dedicated Armour Rock loading jetty for collection and facility to work with customer on delivery logistics. Plans are in place to increase production output to 10 million tonnes PA. With over 700 million tones of reserves Glensanda is a reliable and consistent source of rock and aggregates. Plans are underway to increase the size of vessel capable of being handled at the Armourstone loading berth to approx 200m using a 'stand-off' pontoon. Production of various 'single size' aggregates is already underway, as is the loading of 'bagged' aggregate in standard sized 'tote bags'.